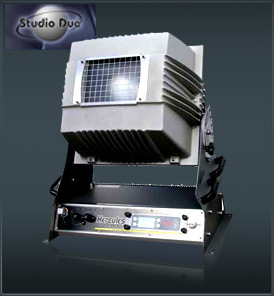 The Studio Due Hercules 800e (with electronic ballast) projects, thanks to an extremely efficient optic system (PATENT PENDING), a powerful light beam which can create numberless color shades. Its performances, in terms of luminousity and lighted surfaces, can reach incredible levels. New concept optical system (WxH 40°x45° or 45°x40°) with rotating parabole to illuminate the surface with maximum horizontal or vertical beam opening. Full CYM unlimited variety of colours and shades. The color changer can be drived with 8 different speeds or in real time. Color filter corrector (6500°K - 3200°K) + 2 colours (pink+red). WxH 40°x45° or 45°x40° max - WxH 25°x30° or 30°x25° min. New concept optical system with rotating parabole to illuminate the surface with maximum horizontal or vertical beam opening. Motorised variation of the beam opening. Standard interface: RS-485; opto-couplet input. Control panel with graphic LCD display and smart reading by DMX start address by a triple led display. Easy and intuitive program and setup by a dynamic menu and four buttons. Real time monitor and full control of lamp power and all electronic ballast parameters. Stand-alone control: auto mode function master/slave (syncro mode) with 5 not editable standard programs and 4 programs for customization by the user. Built-in REAL TIME CLOCK for synchronised auto switch-on/off which is operated on a weekly timer (weekly schedule).